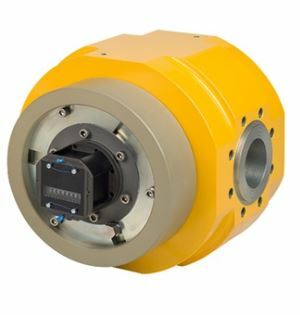 The aluminium casing of the FMR (body and front plate) is designed for working pressures up to 20 barg with a safety factor of 4. The square impellers and the improved position of the main bearings and shafts, make the meter less sensitive to overload and pressure shocks. The aluminum index and the protection of the LF pulsers with the associated magnets, make the meter less sensitive for manipulation by externally applied magnets or other external forces. Tampering of meters with strong neodymium magnets is one of the major concerns of utility companies, as this kind of manipulation is very difficult to detect or prove. In order to be prepared for the “smart grid”, the index can also be equipped with an intelligent encoder. The unique proprietary oiling system, where the oil is distributed directly to the timing gears by means of a disc, eliminates oil loss at high rotor speeds and will lubricate the timing gears at very low loads. All plugs and oil sight glasses are in the front of the meter, allowing the meter to be installed in very compact installations. The FMG rotary gas meter is a displacement type gas meter. The actual measurement is performed by two figure 8-shaped impellers (rotors) rotating within a measurement chamber. During a full revolution of the rotors a fixed volume is displaced from the inlet to the outlet of the meter. The number of revolutions represents the amount of volume passed. The volume is displayed on a direct read counter type index. Several low and high frequency pulsers can be used for flow computing or control purposes.